Kim Lusk's first evening length work presented through Velocity's Made in Seattle program. Subtle humor, technical footwork, 90s pop beats and a bit of country giddy-up in a story about the ultimate power of the unlikely winner. This piece was made possible with support from 128 Kickstarter donors. A fiery solo, a duet performed with only finger tips touching, and an intricate, weaving dance party inspired by 90s raves and ballet. Quartet for the Dead-set premiered at On the Boards' North West New Works Festival. I was supported by Case Van Rij, Jeremy Steward, Faizel Khan, Velocity’s Creative Residency Program, Bainbridge Dance Center, and the University of Washington Dance Program’s bst Residency. Dance, music, video and crushed velvet. A project made simply because we like spreading good vibes via the arts we love. Underdog Solos premiered in Seattle International Dance Festival's Spotlight on Contemporary Ballet, underwritten by Case Van Rij. It was made possible through Velocity's Creative Residency Program and support from Faizel Khan. It has also been presented at Bumbershoot and Vashon Center for the Arts. A piece in four acts inspired by surreal 90s music videos and the feeling of excited anticipation. Ryan Hume's original music jumps between warped pop songs, arhythmic sound scores, and a longing vocals. Trio in Silver premiered in sleepnod's WORK through the Access Velocity program. This piece was made possible through support from the Miller Ongoing Movement Residency, Bainbridge Dance Center, Velocity's Creative Resident Program, the Glenn H. Kawasaki Foundation, and Faizel Khan. Two dancers engage in a playful battle of intricate footwork, opposing melodies, and the often unattainable, yet all consuming desire to simply walk in time with another person. 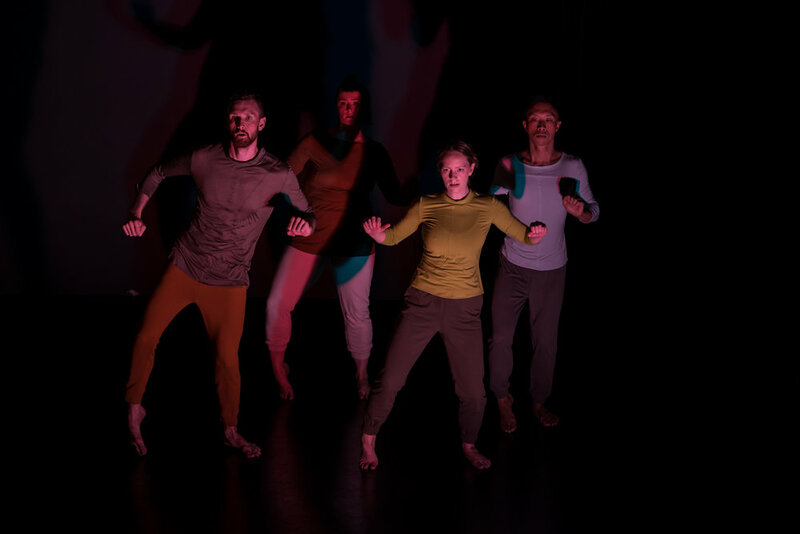 Bang Bang premiered at the Seattle International Dance Festival 2015, and was supported by Velocity's Creative Residency Program. It has been presented at the Seattle International Dance Festival, and Bumbershoot 2015. A high-energy and fast paced solo with precise technique, cheeky surprises and that "I am invincible" feeling you get while dancing to your favorite song. The original music combines let’s-save-the-world-tonight dance beats and a little bit of country giddy-up. The Fully Bounty premiered at Velocity's Next Fest NW 2014, and was supported by Velocity's Creative Residency Program. It has been presented at Velocity, Western Wyoming Community College, and Bumbershoot 2015. A 15 second video that plays with the suspense, drama and characters found in The Strange Meeting of Slim, Ferdinand and Lady O'Neil. BULL is a teaser of sorts for future collaborative video work with Ryan and Kim. In an odd world of matadors, dry humor, and disjointed poetry, three characters find themselves in a dance to the death. The Strange Meeting of Slim, Ferdinand and Lady O'Neil premiered at Connecticut College.